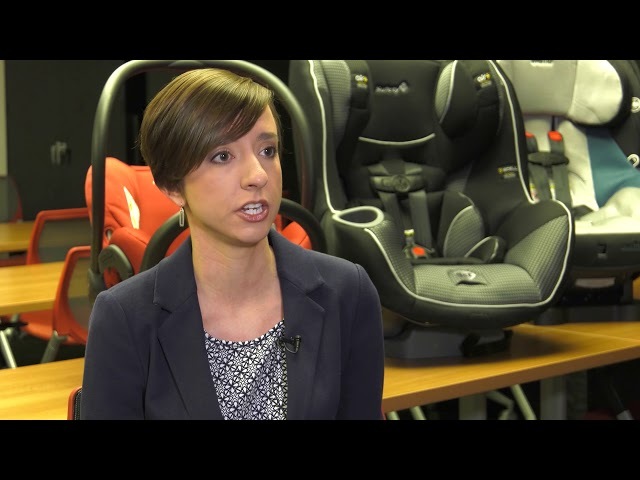 COLUMBUS, Ohio – Rear-facing car seats have been shown to significantly reduce infant and toddler fatalities and injuries in frontal and side-impact crashes, but they’re rarely discussed in terms of rear-impact collisions. Because rear-impact crashes account for more than 25 percent of all accidents, researchers at The Ohio State University Wexner Medical Center conducted a new study to explore the effectiveness of rear-facing car seats in this scenario. Mansfield and her team conducted crash tests with multiple rear-facing car seats, investigating the effects of various features like the carry handle position and anti-rebound bars. The study, published in SAE International, shows that when used correctly, all were effective because they absorbed crash forces while controlling the motion of the child, making rear-facing car seats a good choice in this scenario. Mansfield said what they found aligns well with what is known from crash data in the real world, and it’s important for parents to follow the recommended guidelines on the correct type of car seat for their child’s height, weight and age. “The rear-facing seat is able to support the child’s head, neck and spine and keep those really vulnerable body regions well protected. These regions are especially vulnerable in the newborns and younger children whose spine and vertebrae haven’t fused and fully developed yet,” Mansfield said. This research was funded by the Center for Child Injury Prevention Studies (CChIPS) at The Children’s Hospital of Philadelphia.